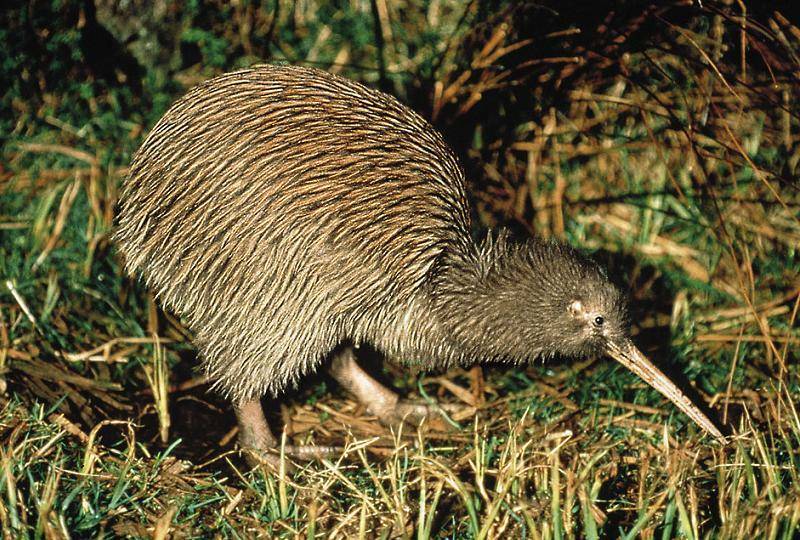 Animal Wildlife | Kiwi | The kiwi is a brown, fuzzy, flightless bird native to the forests and jungles of New Zealand. In recent years the kiwi has become endangered, mainly due to introduced predators like dogs, cats, rats, ferrets and weasels which hunt the kiwi and eat it's eggs. The kiwi is almost helpless against these exotic threats and there are many support organizations for kiwis which run conservation projects to try and protect the remaining kiwi population. The largest of these kiwi conservation projects is run by the Bank of New Zealand. 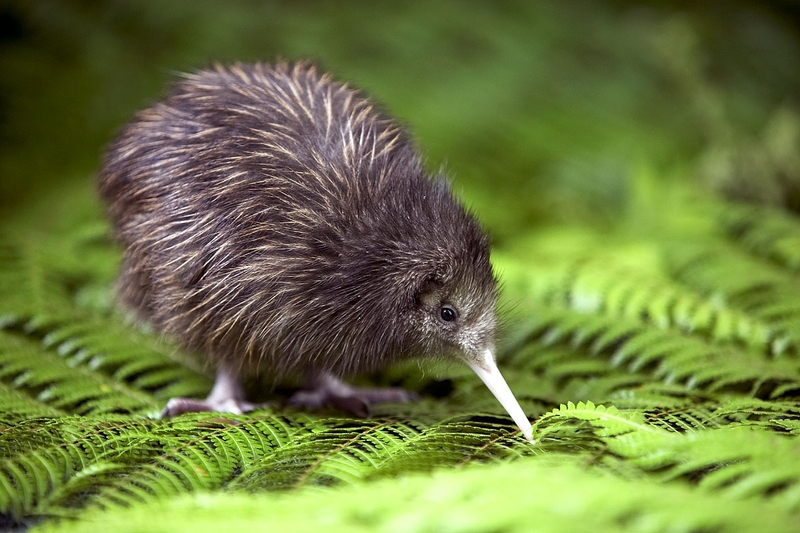 There are many different species of kiwi, but all of them can only be found inhabiting the forests of New Zealand. It is believed that the incredible diversity of this island nation is due to its early separation from Australia and the rest of the continents, millions of years ago, by way of tectonic plate shifting. The kiwi is the national bird and icon of New Zealand. In fact, the native people of New Zealand are often also called Kiwis. The kiwi also appears on many flags and symbols across the islands. The eggs of the kiwi weigh about one pound which is 450g. The beak of the kiwi is about the size of one third of the kiwi's body. 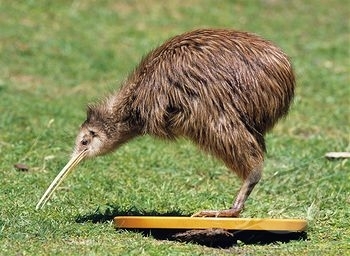 The kiwi uses it's long beak to rummage through the foliage on the ground in search of food. Kiwis are omnivorous animals and eat a variety of both plants and animals. The kiwi mainly hunts out worms, insects and spiders but also eats fruits and berries, generally those that have fallen to the forest floor. The kiwi is thought to be related to the ostrich and the emu, making the kiwi the smallest member of this family of birds. Like it's larger cousins, the kiwi is unable to fly due to it's small wing span and large weight. The kiwi therefore spends it's life foraging on the forest floor. Although kiwis are generally solitary animals, kiwis are known to live in pairs for parts of their lives. These kiwi couples mate only with each other and the female kiwi is known to be larger than the male kiwi, meaning the female kiwi is generally the dominant bird. Before the introduction of animals such as cats and dogs, kiwis roamed New Zealand in great numbers as there were no natural predators there besides humans. 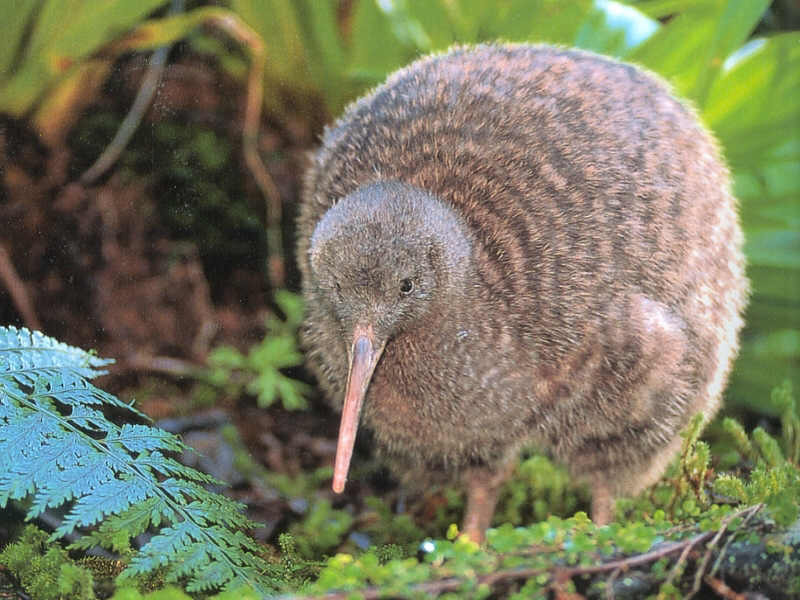 It is since humans settled there with their pets that the kiwi numbers have rapidly declined. Today there are believed to only around 200 kiwis left in the wild. 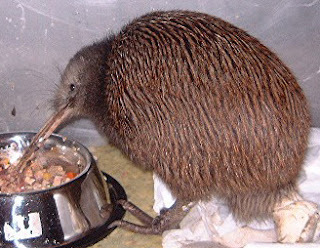 Kiwis are very nomadic birds which means that they are known to move around a great deal rather than staying in one place. 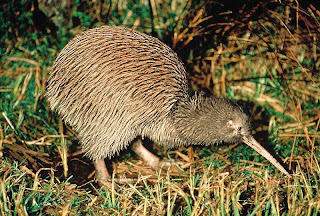 Kiwis dig burrows during the day which they sleep in at night and then move onto another spot and build a new burrow the next day. The only exception to this is when the kiwi is nesting to lay lay it's eggs. 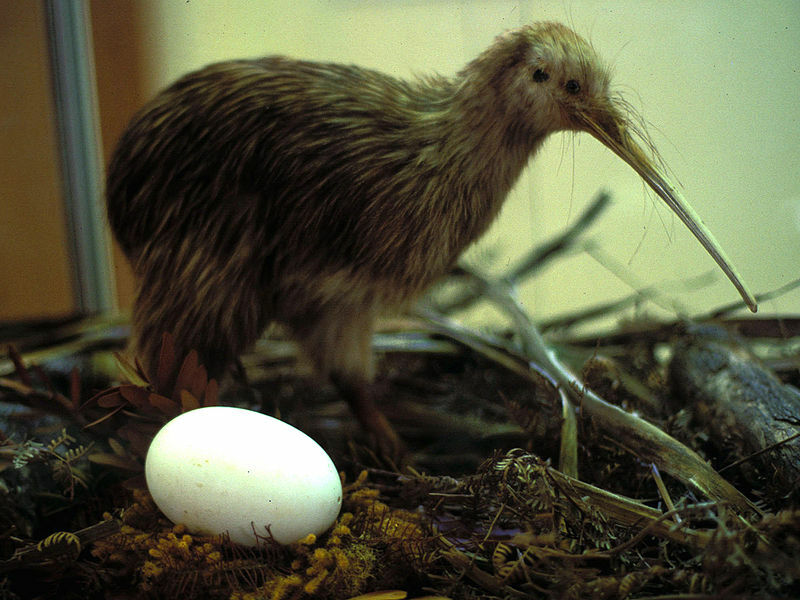 The female kiwi lays an average of five eggs per clutch which take nearly 3 months to hatch. The male kiwi is the one who incubates the eggs for most of the time.